Newly converted, Grade II Listed, luxury, 1 double bedroom, first floor apartment located in prime central Lewes, the historic County Town of East Sussex. Finished to a high specification throughout a particular feature of this property is a very good sized, South facing roof terrace affording stunning, far reaching, panoramic views over Lewes Townscape and to the South Downs and Ouse Valley beyond. With large sash windows and high ceilings synonymous with a building of this era, this apartment enjoys an abundance of natural light throughout. 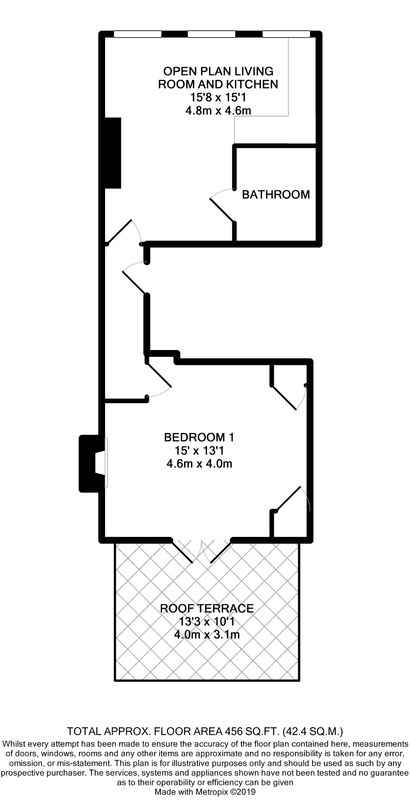 The internal accommodation totals 456 sq ft (TBV) and is complemented by a neutral d	cor. The front door opens to an entrance hall from where there are doors to the principal rooms. The open plan living room/kitchen/dining room boasts 3 large sash windows giving views over the historic Lewes High Street and surrounding Townscape. The modern fitted kitchen is comprised of a range of wall and base units in a bone colour and includes a number of integral appliances specifically; electric oven and hob, extractor hood, fridge and washing machine and this room is accented by recessed ceiling spotlighting. A door opens from the living area to a luxury bathroom. The modern white suite is comprised of a bath with shower over, glass screen door and tiled surrounds, toilet, wash hand basin, heated towel rail and a fitted mirror. Completing the accommodation is a double bedroom with fitted wardrobes, feature fireplace and an impressive 13ft (TBV) South facing roof terrace affording stunning, far reaching, panoramic views over Lewes Townscape and to the South Downs and Ouse Valley beyond. Agents notes: Secure entry phone system. GCH. 125 Year Lease. Liability for 30% of the overall maintenance of the building (TBV) Ground Rent currently £250 per annum (TBV). Nestled within the South Downs National Park, Lewes is the County Town of East Sussex and Lewes mainline railway station offers a fast train service to London Victoria (approximately. 1hr 10 minutes). The A27 lies a short distance to the south of Lewes and provides fast access to the A23/M23, Gatwick Airport and the national motorway network. The coastal, business and entertainment city of Brighton & Hove is some 8 miles distant. 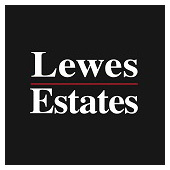 Lewes has an excellent range of amenities including an array of restaurants and recreational facilities, 3 prime supermarkets, caf	s, art galleries, shops public houses and award-winning independent cinema. The internationally recognised Glyndebourne Opera House is located approx. 4 miles from Lewes. Lewes offers several highly regarded primary schools as well as Priory Secondary School, Sussex Downs College and Lewes Old Grammar School.